Engagement Surveys: Are They Worth It? 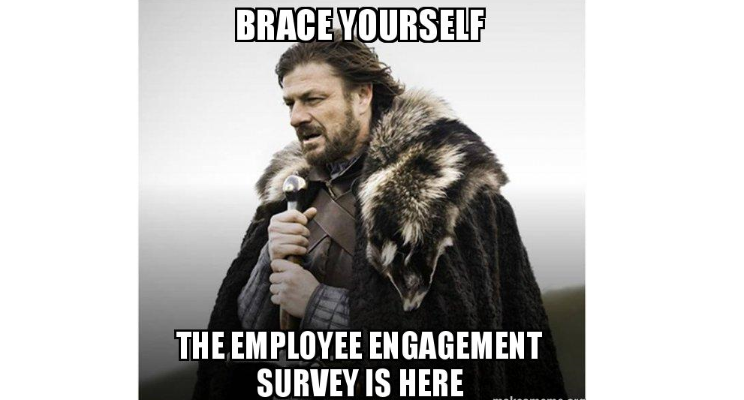 There’s been a lot of hate going around about employee surveys recently. People complain that they are long-winded and tedious, ask irrelevant and non-specific questions and at the end of the day don’t result in any change. HR departments spend a great deal of time administering surveys and analyzing the data (not to mention the time it takes for employees to complete). Many traditional surveys ask so many questions that answering them is a real burden. Surveys have the potential to be a big waste of time and resources when they don’t result in any real change! Often survey results are packaged into a document that then ends up sitting on the shelf. All the time employees have invested in giving feedback is ignored and they feel even more dissatisfied that they aren’t being heard by the organization. Being ignored by the organization often results in a deterioration of the response rate over time. Employees quickly realize that it is a waste of their time to complete the survey. Crappy response rates result in data that isn’t truly reflective of the overall state of the organization. Data also becomes irrelevant when the results of surveys are influenced by managers. When employees believe that their leaders will figure out that their survey responses were written by them, they may change or adjust their responses to avoid getting on the “bad side of the boss”. The term ‘engagement’ is somewhat ambiguous and difficult to define, let alone measure. However, employee engagement as we view it here at Acuity HR is critical in building a stellar workplace culture (read Brad’s blog for some further insight). There is powerful research out there that indicates that engagement really does result in increased profitability, productivity, customer satisfaction and decreases quality defects, safety incidents and absenteeism. Employee Engagement matters; it is a competitive advantage. More often than not, decisions based upon data will have better results. A study conducted by the MIT Center for Digital Business found that data driven decision making is associated with a 5-6% increase in output and productivity. This is intuitive – decisions backed by solid data are more likely to lead to better results. Data is often difficult to come by for HR departments (because HR deals with unpredictable people with emotions and feelings as opposed to hard numbers and facts). It’s a real shame that HR departments are giving up a great method of gathering data and feedback just because of the ineffectiveness and inconvenience of the traditional engagement survey. There is real value in accumulating data and feedback to measure the core elements needed to attract, focus and retain talent within an organization. In my next blog post I’ll talk more about how to gather this information while keeping the process as painless as possible. Stay tuned!